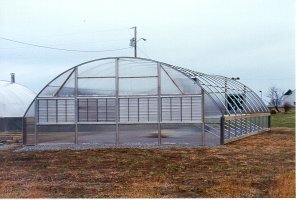 Like our other greenhouse series, the "H" series greenhouses are designed to give our customers the flexibility to get the size of greenhouse they require. We offer the "H" series greenhouses in five different widths: 16', 18', 20', 24', and 30'. All are available in any length in 5' increments. Each of our "H" series greenhouse packages include: bows spaced on 5' centers, 5' long anchors giving you a sidewall height of approximately 3 1/2', corner wind braces, purlin, all connecting hardware, and instructions. The "H" series greenhouse is an ideal choice where an inexpensive, yet strong and dependable house is desired. These houses can be equipped with any or all of a wide variety of accessories to assist in your growing needs. We would appreciate the opportunity to quote you on your greenhouse needs.